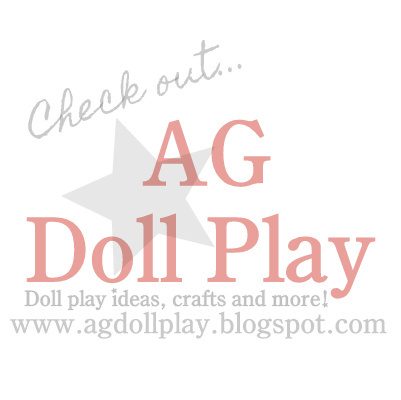 I wanted to share with you a fun new doll product that I recently discovered. The site Ahhprods sells primarily bean bag chairs...any color or pattern that you could possibly dream up in fact! In addition to the human/child version sized bean bag chairs I happily discovered that they make and sell matching doll sized bean bag chairs as well which they call "LiL Me" chairs! You could get a matching set for your child and their doll OR you could simply buy one for your doll. I also discovered that two dolls can cozy up on one bean bag chair quite nicely as well. Bonus! The dolls don't fall off like with the regular hard chairs you can buy - the bean bag conforms to the doll and holds her in place. We got a nice fleecy type feeling fabric but their are many options to choose from when you are looking. Another nice thing and something that I feel good about when supporting this business and their products is that they are made in the U.S.A. There aren't many things that you can say that about anymore! They even have certified organic cotton ones, plus a ton of colors and prints and fabrics to select from. The doll chairs are perfectly sized for the 18 inch American Girl dolls or similar sized dolls (14 inches wide and 7 inches tall to be exact) and they come equipped with a child-resistant zipper, which can be locked and unlocked just like our exclusive liners for the child sized bean bags. Curious kids, however, will not be able to easily unzip them. No one wants filling flying everywhere! We are tickled with our LiL Me bean bag chair from Ahhprods and can totally see the dolls having fun with it at a sleepover soon. We might have to make that happen this weekend! Ahhprods is currently having a giveaway on their blog through May 31st...click here for the details on how to enter and to have the chance to win a "LiL Me" bean bag chair! They are so fun!! Love all the colors and patterns too!